Several weeks ago I had the fortune to meet with Fatuma Abdulahi, Communications Officer for Accountability for the Danish Refugee Council (DRC), the person behind the HIF project called “Piloting Accountability Systems for Humanitarian Aid in Somalia”, in partnership with UNICEF through the CDRD project (Community-Driven Recovery and Development). 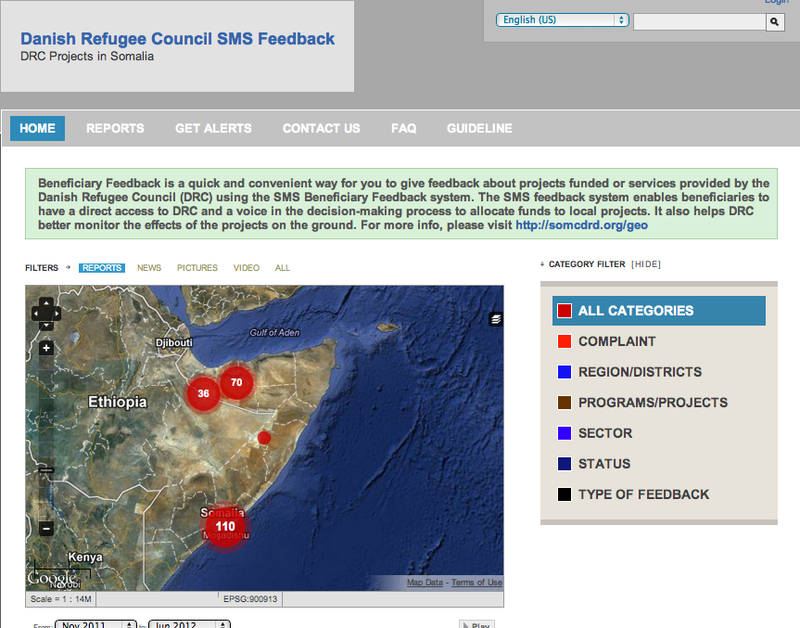 Also called “SMS Beneficiary Feedback”, the project is a quick and convenient way for Somali beneficiaries to give feedback about projects funded or services provided by the Danish Refugee Council using an SMS feedback system. The system enables beneficiaries to have a direct access to DRC and a voice in the decision-making process to allocate funds to local projects. 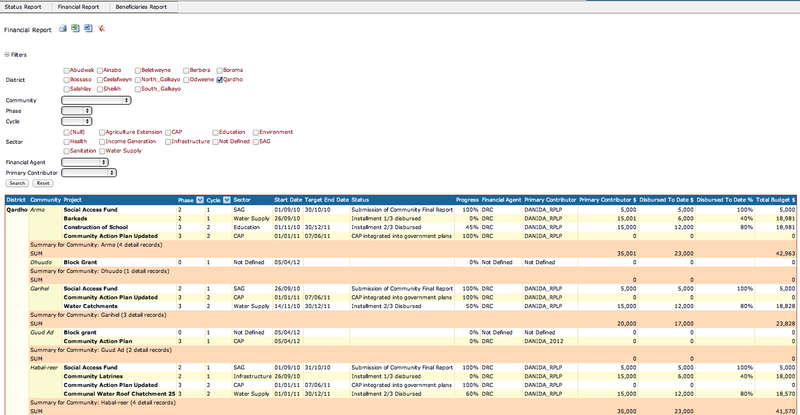 It also helps DRC better monitor the effects of the projects on the ground (For more info see here). I have been interested in accountability systems for Humanitarian organizations since long time and I blogger before about this very topic. 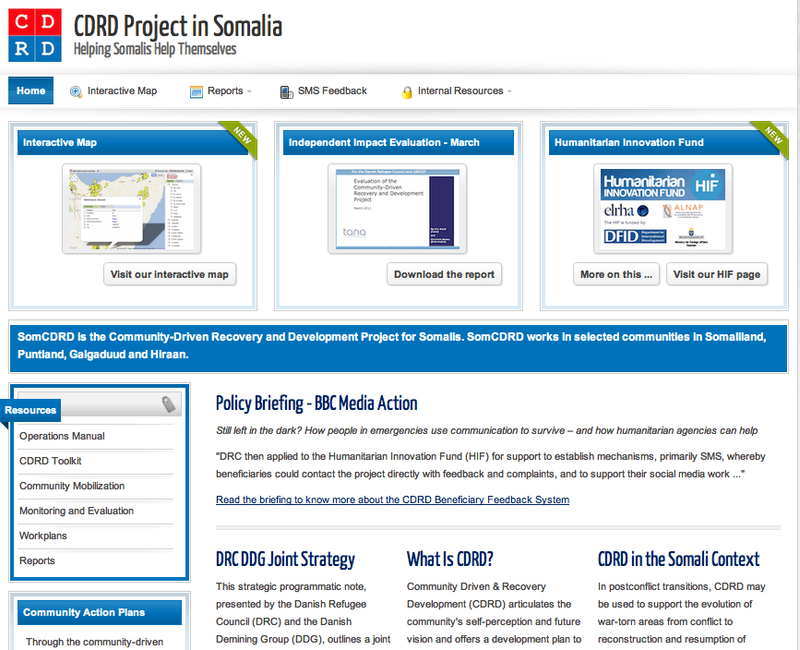 This DRC project is the first project I have heard about (ever) that uses mobile technology and crisis mapping to create a completely transparent and direct communication system in between a humanitarian organization and its beneficiaries on the ground. 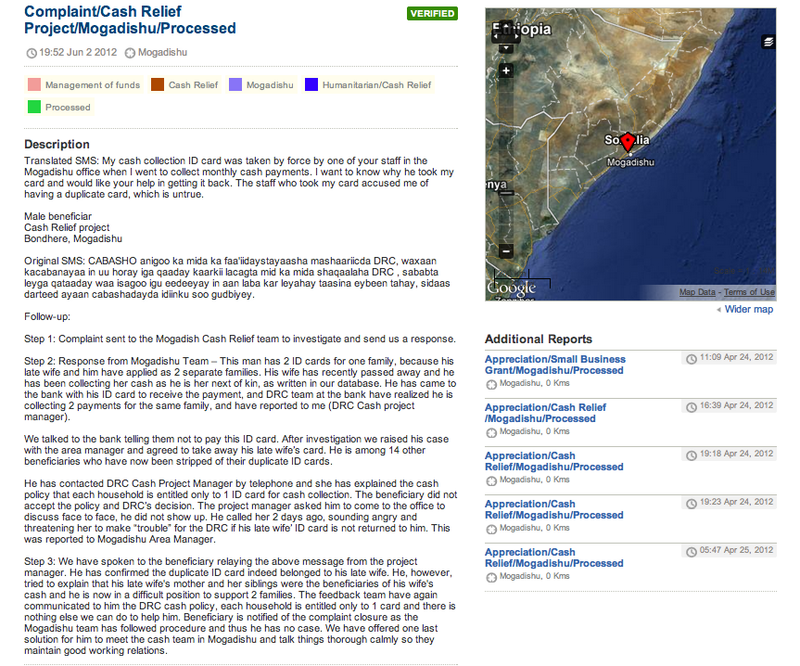 And if this wasn’t enough, this project is taking place in Somalia, not exactly the safest place on earth. 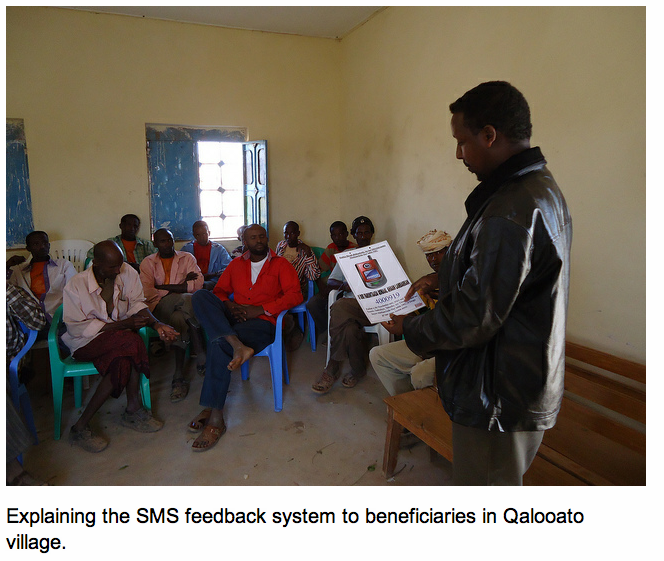 The SMS Beneficiaries Feedback project is a very simple system that basically creates something that most NGOs and humanitarian agencies should have done and learned from the private sector: it creates a calling center for DRC beneficiaries in Somalia. 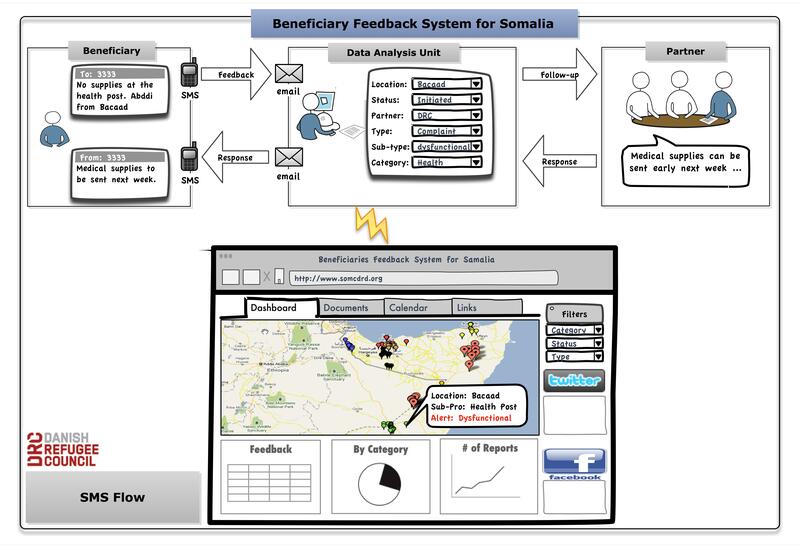 Since the start of the project in September 2011, beneficiary SMS feedback has been implemented in 31 towns and villages in the North and East of Somalia. Now, the project is extended to a number of districts in Mogadishu from where hundreds of SMS’ are submitted every months (see here). Since then Fatuma has been going around in Somalia basically talking to all those families and beneficiaries and explaining them the project and the possible outcomes of it. The fact that she actually went to meet all of them in person respond to one of the first possible criticism against this project: managing expectations and deliver a clear message. The fact that beneficiaries can contact the aid organization in fact is always seen as possible disaster in terms of what they will expect once that direct channel is created. For the past 2 years, every time I have been talking about the possibility to do something like this, the answer I got from aid organizations was that this would have let people think that once they communicate their needs, the aid organization had to respond by delivering what beneficiaries need or ask for. The nightmare of humanitarian organizations thinking about doing something like this, is the prospect of thousands of messages asking for more help, that would then become thousands of angry people that have seen their expectations deloused by overwhelmed aid agencies. Fatuma did what is the most simple and easy way to do this: went to meet people in person and explained to them what they could expect and how – leveraging also on the fact the Somali society is based on an oral culture. She also explained to them something really simple: this is not a crowdsourcing/help line, this is a system to find out how and if beneficiaries of the DRC program are actually satisfied from the service provided to them and what can be done better. 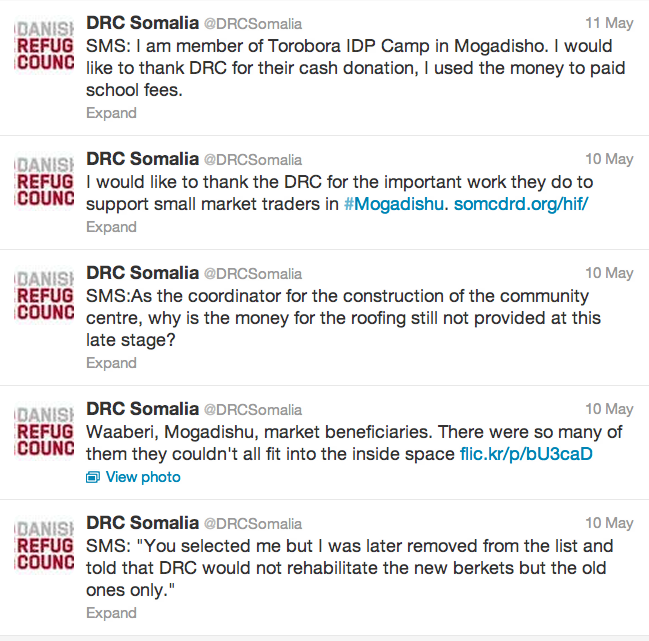 The ways people can communicate with DRC is channeled in two ways: SMS and phone calls. So what happen next? 1. The first thing that happened is that all the messages are translated into English and channel to the right department/office inside the organization. Each message is reviewed and given an answer to. The speed of the answer depends of course on the readiness/speed of the relative office/officers inside DRC that can respond to that inquiry. 3. 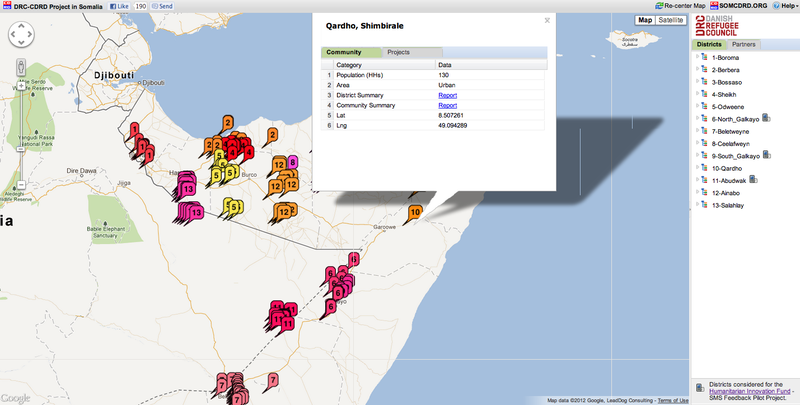 This all process is documented step by step on a Ushahidi platform, where all SMS are mapped and all responses/commentaries are showed. The incredible part of this project is that the entire process is completely public and open: all messages and all answers are made public in the platform, including complains, no yet responded messages, appreciations messages and so on. Again, this is not just “dots on a map”: each mapped project had attached the financial and beneficiary report, where it is possible to monitor how much money have been spent, where and from whom the money are coming from. The reason why I love this project is that it is really showing not only that transparency and accountability is possible in humanitarian aid, but also that it is pretty simple and can be done avoiding to raise expectations with very simple technologies. In addition to this, the system is also supported by a Flickr page, a Twitter account and aBlog. Again all messages (complains as well as compliments or appreciation messages) are shared on the Twitetr page, while it is possible to see the sites and the projects pictures on the Flickr page and to read stories from Somalia on the Blog. The SMS system, based on a Galaxy Tab app to receive and send messages to the Ushahidi platform, needs to be online to work. The system DRC is using, based on a Galaxy Tab app to receive and send messages to the Ushahidi platform that therefore needs to be online to work, could be improved by using a simple method like FrontlineSMS or, if the number of SMS is actually high and she envision the possibility to receive hundreds of SMS a day, to use something more robust like RapidSMS or Souktel. What DRC could also to make this system faster and more sustainable in the long term would be to outsource or better crowdsource the translation and processing of the SMS by using, for example, students from the Universities in Somalia and giving them credits in exchange of this. DRC could also think about creating a Crowdflower account and have the entire translation process done by anonymous volunteers around the world – something that could be done only giving a closer look to the sensitivity of the information and the possibility to anonymize the sources. This pilot project is an incredible project that should be looked at the first experiment in the field of transparency and accountability for humanitarian organizations and crisis mapping. The M&E of this project could be used to pave the path for more projects like this, and lessons learned from this project could be used by other organizations to follow the same route. 1. Do not use technology to replace the in person dialog. Use it to support it. 2. Manage expectations with dialog and timely accurate information, not with silence. 3. Make sure that a response mechanism is in place, so that people may not have what they want, but they feel they are being heard and they are having a dialogue. 4. Integrate all the system you have and you can possibly use: face to face, SMS, voice calls, social media. A combination of tools is also a combination of resources and people, and as such as a great potential. 5. Transparency in humanitarian aid is and will continue to be a fundamental factor that will not only make the difference in between successful and unsuccessful projects, but also in between sustainable and not sustainable relationships with beneficiaries on the ground. Kudos to Fatuma, the DRC team and the Humanitarian Innovation Fund for this incredible project!